Go to school. Get a qualification. Get hired. Work hard and long. Retire. The end. This story has become totally obsolete in today’s world! The reality is that in South Africa, in particular, the schooling system is not up to the standards that it should be and colleges and universities do not provide students and graduates with practical, work-readiness and entrepreneurial skills programmes to prepare them for what is out there. According to NUMSA, South Africa’s youth unemployment rate is the third worst in the world. According to the Financial Mail, the unemployment rate among youth is 36%. About 3,3m youth aged 15-34 are not employed or studying. According to the Mail & Guardian, out of a population of 49-million, 7.5-million South Africans are out of work. Young people are worst affected, with over half of 18- to 25-year-olds unemployed. Fear not! There is always help to be found. We offer a number of skills programmes and courses that will assist you in either setting up your very own business or becoming a valuable employee. Our training is not about books and theory. Although it is important to equip yourself properly, we have a strong focus on the ‘doing’ part of learning. The courses on offer can be tied into Internship programmes and Learner-ship programmes. See our courses or Contact us for more information. The reality is that school education these days does not provide students and graduates with the practical skills and knowledge necessary to start employment in many IT positions. How does an organization “grow” solutions consultants, project managers, data analysts, system engineers? With difficulty. We make it easy for our customers! Our work-readiness and entrepreneurial skills programmes focus on developing problem-solving, analytical thinkers, who flexibly grow into their job requirements. The job entrants will have the confidence to hit the ground running! Organisations can grow competency in their technical skill areas with loyal, talented, business-savvy youth, who hold knowledge and experience gained from Velisa Africa! Included in that is the real need to fill skills gaps with South African people. South Africa’s unemployment rate came in at 27.7 percent in the third quarter of 2017, the same as in the previous two quarters and remaining the highest rate in 13 years. The number of unemployed rose by 33 thousand to 6.21 million and the number of employed advanced by 92 thousand to 16.19 million. 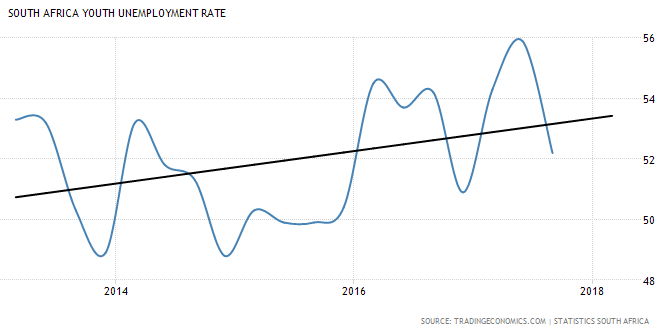 Unemployment Rate in South Africa averaged 25.50 percent from 2000 until 2017, reaching an all time high of 31.20 percent in the first quarter of 2003 and a record low of 21.50 percent in the fourth quarter of 2008. The number of unemployed persons in South Africa increased to 6210 Thousand in the third quarter of 2017 from 6177 Thousand in the second quarter of 2017. Unemployed Persons in South Africa averaged 4766.65 Thousand from 2001 until 2017, reaching an all time high of 6214.11 Thousand in the first quarter of 2017 and a record low of 3873 Thousand in the fourth quarter of 2008. Youth Unemployment Rate in South Africa decreased to 52.20 percent in the third quarter of 2017 from 55.90 percent in the second quarter of 2017. Youth Unemployment Rate in South Africa averaged 51.95 percent from 2013 until 2017, reaching an all time high of 55.90 percent in the second quarter of 2017 and a record low of 48.80 percent in the fourth quarter of 2014. The Academy offers a complete and holistic range of training programmes, internships and learnership programmes that fulfil your skills development and BEE quota, but more than that, they develop the abilities, skills and competencies of the youth to lead a successful and respectable career path. Our training is not about books and theory. Although it is important to equip people properly with knowledge, we have a strong focus on the ‘doing’ part of learning. We generally work on the basis of 20% knowledge-learning, 20% task-based learning, 10% self-learning and 50% experiential learning. And 100% corporate-behavioural awareness improvement.